It's May 4th and its my 23rd Birthday!!! Now I enter my 23rd year of life, how nostalgic I feel. I have had a fun filled life so far and my fun continues to go on and on as the years tick by. It was this time last year that I made the leap into world of figure collecting, I remember sitting around with my birthday money last year wondering what I should buy and I saw these awesome Appleseed Ex Machina figures on sale at Hobby Link Japan, an online store where I had been eyeing up the world of figures with lust and desire. I took my money in hand and made my purchase, and it was the beginning of something beautiful. Although some may know that my actual first figure was Fraulein Revoltech Ami Futami whom I found when browsing a local online trader called Trademe. It was Ami who led me to search the internet for more fun articulated anime-esq figures. 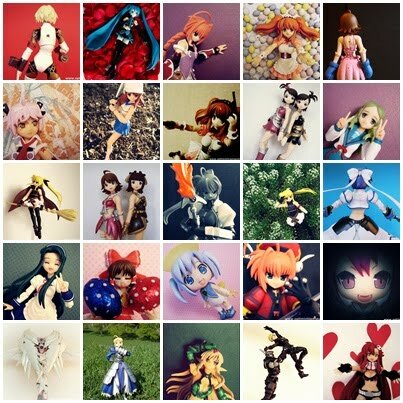 And so a year has passed and my three figures have now turned into my own little army of figures, a website, an art site, and a new world of friends and fun. I have found a new and fun outlet for creativity and hobby which I can see myself having for a long time to come. So happy birthday to me I say! and reminisce the years that have passed and especially the year that has passed, the year I started figure collecting. Happy birthday! And usually if I don't know character's birthday I just use the date I got it on. So happy birthday Ami! XD Have a good one now!